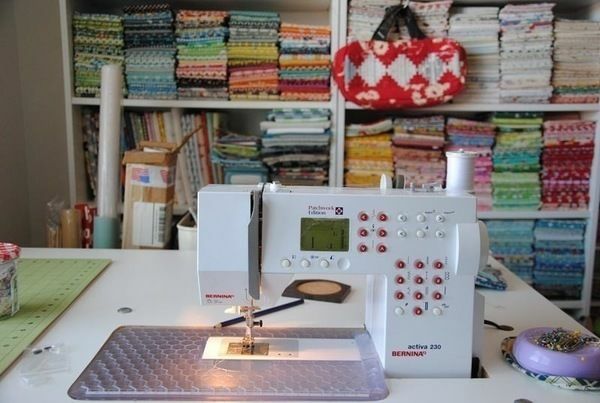 Come behind the scenes at Quarter Inch Mark and see Chase's patchwork studio in New York City. It's filled with all the fabrics that I've collected over the years and some sweet gifts that I have received from all over the world. It's where I feel motivated and inspired. Our apartment in the city is very small, so have a room that designated for the studio is not an option when we first moved here. I have set up the studio in one of the bigger bedroom instead. The studio space is measured around 8'x10'. I have been sewing quilts, custom patchwork pouches, and write sewing patterns in the space mostly. Since the room space is limited, I have use a shelve that I custom made years ago as a divider to separate the actual bedroom side. So it really provides a nice studio space for me. The patchwork studio contents with sewing supplies, fabrics, and lots colors and that just motivate me daily. Over the years, I have found using clear boxes are the best to organize for the fabrics. I have organized the fabrics mostly by the designers into the boxes as well as some vintage feedsack collection. Fabrics on the shelves are mostly sort by colors. The sewing supplies are all sorted into the jewelry containers that can be found in any craft stores. So, it helps to pull the containers out for the different projects. Since the space is so limited, I actually try to find any space that I could use to put away the containers, so it makes the space less clutter. It is also great idea to sort through supplies by categories as well. For example, zippers in one box, embroidery floss in one and mostly make it easy access for work time. The favorite possessions would be the fabrics and handmade gifts from friends for sure. I have been collecting fabrics over 15 years. I have small handmade items display in the living room area and in the studio space. These handmade gifts are group together, so it reminds me of the friendship that extended to me. I keep a couple sketchbooks around and draw ideas into my daily planner every morning before I start the daily agenda. I also take photos when I see something that is fun and interesting. I travelled oversea often in the past few years. I love seeing different culture and ideas that sparkle to me. It would be awesome to have a room or space for the studio. So I could have things more layout less clutter. I would also love a large table that can sit 10 people in. So I can have friends and students come over to sew with me. Last, would be a large table for cutting fabrics, so no needs to move the fabrics around each time.